The 2-Fer™ is a 2-way power splitter + 2-way DMX splitter, all housed together in 1 convenient unit. It’s an ideal accessory for use in any situation where powerCON® power cables and DMX cables are frequently used, plus, it’s also a great fit with Blizzard’s DMX-PC (DMX + powerCON® compatible) combo cables. These well-built and reliable units are designed to make users lives and lighting setups a whole lot simpler! 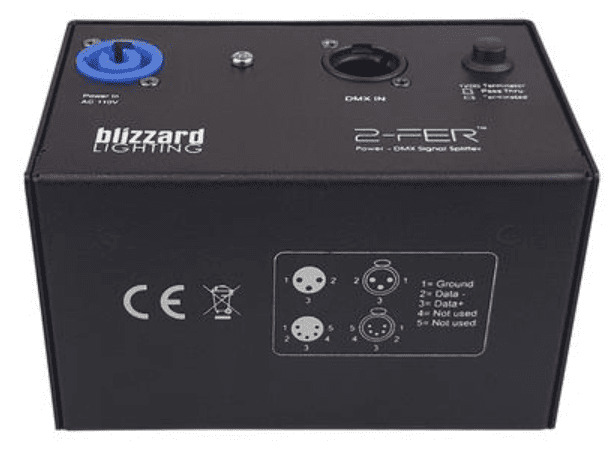 2-Fer™ units are highly reliable and are fitted with 1x 20A powerCON® compatible input and 2x 20A powerCON® compatible outputs (flush mounted), plus, they come with the choice of either 3-pin DMX (2-FER-3PIN) or 5-pin (2-FER-5PIN) DMX connectors with 1 signal input and 2 signal outputs. The DMX connectors on 2-Fer™ splitters are 100% optically isolated, and the units are also equipped with a built-in 120Ω terminator/pass thru switch for completing a DMX chain properly.